Picky. Hungry. Plump. Cheesy. Contented. Fed Up. Today I was fed up a little outside of Austin. 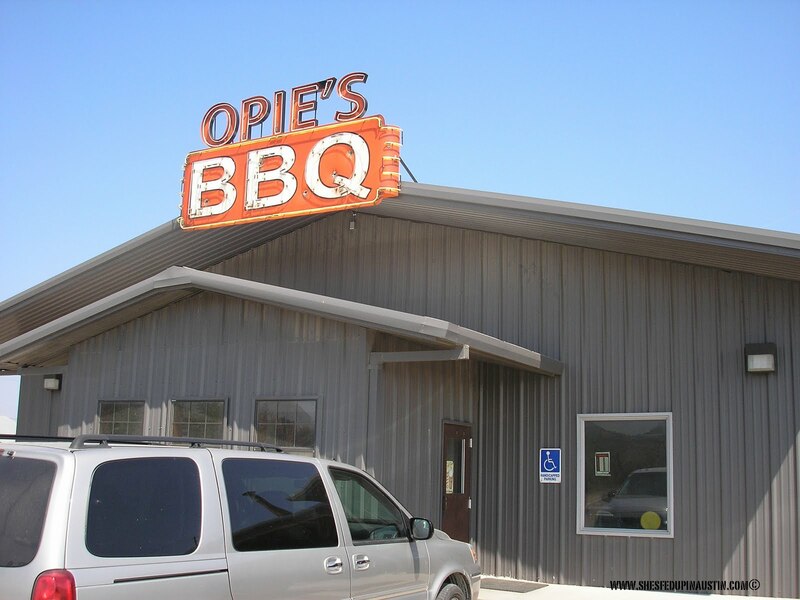 I fear that if Opie's were closer I'd be there all the time. I'd go up a pant size for sure, but it would be worth it. The welcoming smell of smoke hits you before you enter and to further entice you, you get to choose your meats from a smoke box inside the door where a nice young guy will cut your choice of meats. The meats were all glistening with a barbecue aura. You know when a cartoon character sees another curvaceous cartoon character and suddenly floating hearts come out of his eyes? I might have actually looked like that when I saw the meat smorgasbord in front of me. The guy cutting the meat was very nice and helpful, but I couldn't tell you what he looked like, if that gives you any indication. Your cutter will pass off the meats to another friendly employee that weighs and wraps your choices in butcher paper. You move through a line and get your sides. I knew going in that I wanted to try the brisket, the sweet and spicy baby backs, the tater tot casserole and one of their homemade desserts. I thought I had a game plan, but I almost fell apart at all the dessert choices. They cartoon eyes went "boing" again. There's probably ten feet of counter space with their baked goods, each one as tempting as the next. We chose the Cola cake, then before we left, we bought a giant brownie "for the road". 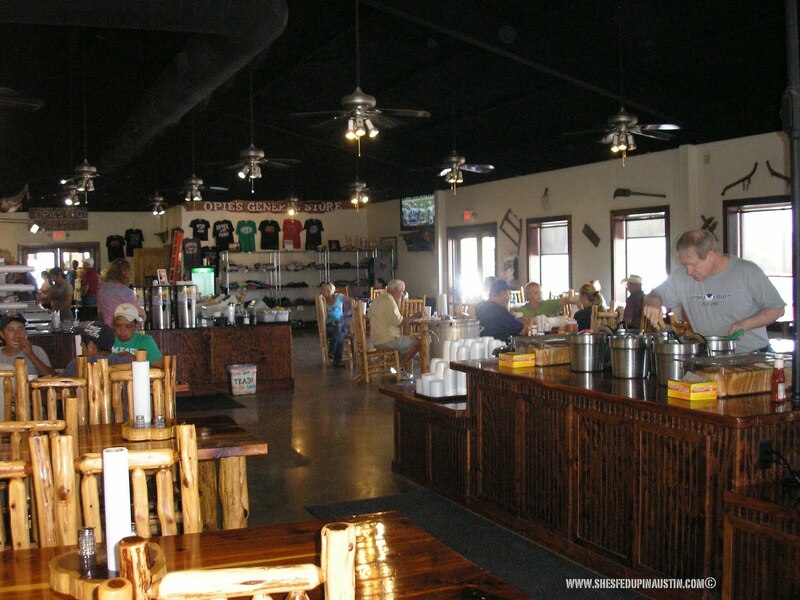 Once you've paid, you get your drinks and find a table, and visit the island in the middle of the restaurant for free pinto beans and warm BBQ sauce. I can't stress enough the importance of making warm sauce available. 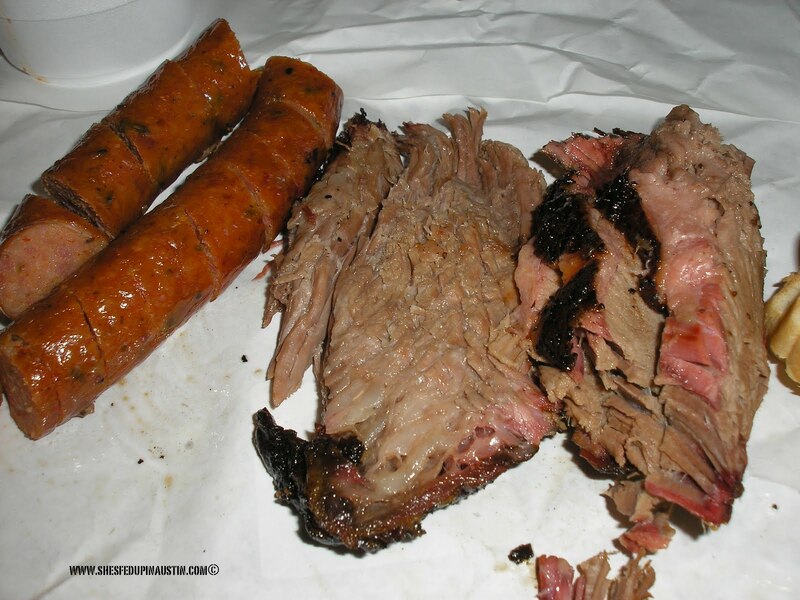 I'm still harboring bitter resentment for another BBQ restaurant that served me sauce out of the refrigerator, thus taking the temperature of my meat down with it. (I'm talking to you Green Mesquite). There are other free things on the island, like white bread, jalapenos, onions. Just help yourself to it all. 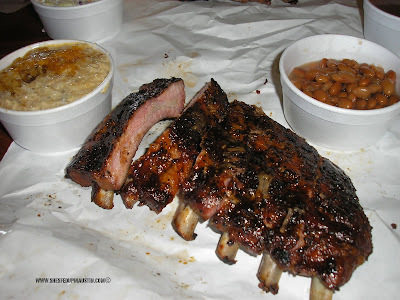 Don't let anyone ever tell you that you can't have good barbecue with good sides. And what's wrong with having good sides anyway? Can you blame a girl for wanting a little starch to break up a meat fest? Is it wrong to enjoy a symphony of meaty, cheesy, potato-y, beanie sweet and saltiness that elevate each other into a new taste experience each time? Did I just go a little too cheesy? Yeah. Oh well. The tater tot casserole isn't something you'd normally find in a restaurant. I have a little collection of those cookbooks that church women's groups put together with the plastic binding. Open any of those cookbooks to any page and you'll find a casserole with cream of mushroom soup in it. I think the tater tot casserole is one of those recipes. I'm guessing it's simply tater tots, cream of mushroom soup, cheddar and Durkee french fried onions from a can. I will say that their mushroom pieces were too big to have been from Campbell's*, so there's still some mystery to be uncovered. The beans were even more mysterious because they had a lot of flavor, but seemed very simple. Just pinto beans cooked slightly firm, not mushy, and salted well. Maybe a trace of meat in the stock. I don't know, just good. They are probably the best free beans I've ever eaten at a restaurant. I've already commented on how many desserts there were. Each was a generously cut portion, like your grandma who wants to fatten you up cut a piece. The size of the desserts was probably the only thing that stopped me from buying one of each. The Cola cake was divine. It was the moistest cake I've had. It was flavored with coconut and either walnuts or pecans. 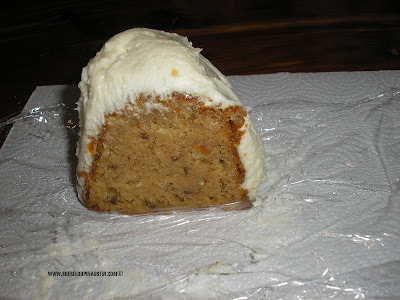 It reminded me of one of my favorite "fancy cakes", the Italian cream cake, but with cream cheese frosting. Oh, and it must have a lot of butter. I started talking like Paula Deen while I was eating it. 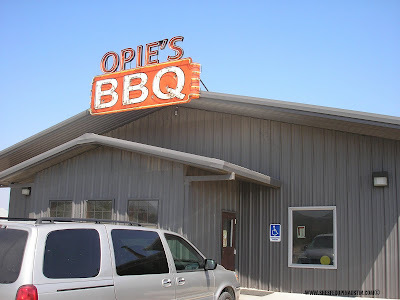 In the end, Opie's gets that barbecued meats and church-pie-supper cookin' are a perfect marriage. *Little side story about Campbell's Cream of Mushroom soup. My mom used to make creamy tuna casserole with it sometimes when she was out of Cream of Chicken. I didn't like mushrooms, so I would carefully extract every tiny piece of them out of my dish. When I finished, there weren't even enough to fill a thimble. I might still be that picky. But, I ate all my casserole today without picking out mushrooms. 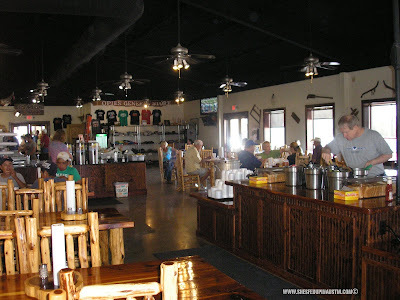 I was looking for blogs about Spicewood to share on our site and I came across your post...If you're open to it, shoot me an email at jane(at)dwellable(dot)com.